The Vita installment of Ridge Racer recently released this past Tuesday in North America, and the one year anniversary of the Nintendo 3DS on this continent is coming soon. 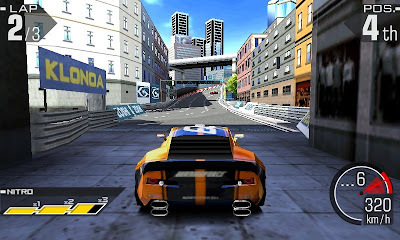 It seems like a perfect moment to review a launch game for the system, Ridge Racer 3D. Ridge Racer has been a staple of many system launches. However, over recent years the series has dwindled and declined in popularity and has almost become a joke. With the infamous Sony E3 press conference having Kaz Harai gleaming "RIIIIIIIIDGE RAAAAACER" and the latest entry in the franchise revving up on the PlayStation Vita with only a handful of tracks and loads of downloadable content, what was once a proud series is slowly and steadily losing traction. Then there stands the Nintendo 3DS launch title Ridge Racer 3D. Does an extra dimension add to the fun, or does this installment of Ridge Racer come in last place? 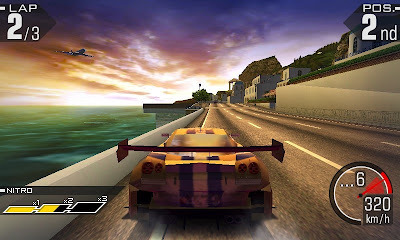 What most players will spend the majority of their time in Ridge Racer 3D is the Grand Prix mode, made up of three difficulties: Beginner, Advanced, and Expert. Players start in the Beginning series of events, doing their best to succeed and complete tasks. For instance, a given Grand Prix is comprised of four races. Each race you must reach the required position and cross the finish line to advance to the next race. While you can advance by just getting second or third in the first three races, the final race is always one where you must cross the finish line in first. By completing a Grand Prix, you open up the next event or set of events. The structure is a branching tree of events that are eventually lead to the final event where you must clear it in order to unlock the next difficulty of Grand Prix races. In total, there are over fifty unique events to take part in. However, the constant goal of getting in the top of the pack can get repetitive quite easily. with the aim of getting to the front. The majority of events have you racing against seven other AI controlled cars. You are stuck at the start at the back of the pack with first place anywhere between a quarter of a lap to a half lap ahead of you. The goal is to get to the front of the pack and reach and finish in one of the qualifying positions. As you race on the different circuits, you get progress reports of how far away you are to the number one racer. The main feat is not really worrying about passing up the other cars but constantly gaining on the first place driver with each section of track, each lap, and each corner. 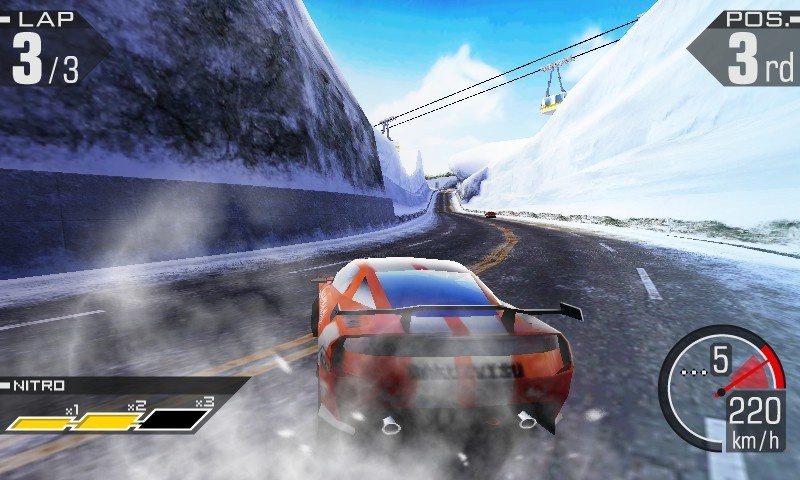 Speeding around corners and sharp turns in the game is essential in Ridge Racer 3D, and this is performed by accomplishing a drift. You let off the accelerator and then ease onto it again to drift. The premise here is to keep your speed up while sliding around corners and turns. As you drift, your nitrous gauge increases. The faster and more sharper your drift, the more your gauge increases. It can be filled up three portions, allowing you to use one nitrous, double nitrous, or even triple nitrous to soar past the competition. Later events on the more challenging difficulties can be occasionally frustrating as it seems that the CPU rubber-bands you. That is, they speed up inexplicably just to catch up to you or to lose you. It appears that if you are not running the race up to the game's standards and are behind the first place driver further than the game desires you to be, the AI will outrun you no matter what. This can be infuriating. to the 3D screen make for an impressive sight. Nonetheless, you begin the game with a bunch of slower Category 4 cars. As you move on in the various Grand Prix events, you unlock faster machines (up to Category 1) that allow you to tear up each track at swifter speeds. Each race you complete earns you player points. These are used to purchase new vehicles with individual top speeds, builds, customizable color combinations, and nitrous kits. The faster cars are much looser and tend to slip and slide all over corners and turns which makes for a difficult drive. Mastering your vehicle is key to completing the various events Ridge Racer 3D thrusts in front of you. 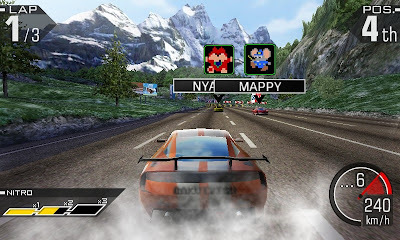 Apart from the Grand Prix, there are an abundant array of modes to choose from such as Time Attack (a time trial mode), a race where you compete against seven players who sport the same vehicle model as you do, and a track selection method that bases the game's choices off of how long you wish to play. After each race, you can opt to save a replay of your racing finesse for future enjoyment. If you have StreetPass enabled, you can find other players' ghosts to race against. Unfortunately, there is no online option to be found. I think this is a serious oversight to what could have been a game that players could keep coming back to time and time again. As it is now, you can only do local play. There are fifteen unique circuits in the game. They range from races through sunset-soaked beaches, airports, rides through underwater tunnels, ancient ruins, atop seaside cliffs, through rugged Arizonian-like red canyons, and through busy and bustling metropolises. Each circuit comes in normal form and reverse form where you race the same track but only in reverse. There are also mirrored courses that unlock much further into the game, effectively adding a lot of tracks to learn the ins and outs of. The lighting is okay, but the 3DS can do so much better than this. 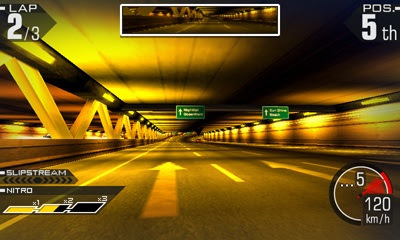 Ridge Racer 3D is not a graphical showcase of the Nintendo 3DS system's hardware. It looks like a glorified early PSP game at worst and a mid-range PSP game at best. Textures are blurry, the frame-rate dips below 30 fps on numerous occasions, there are a lot of jaggies to be found, there is rampant slowdown when the action gets more intense, and the various vehicles look sickly. Meanwhile on the sound front, each race gives you the opportunity to select from one of dozens of tracks. Most of them come from either the techno or rock side of the musical spectrum, so if you find a favorite song, there is nothing stopping you from playing it ad infinitum. The only problem I have with the game's sound stems from the incredibly obnoxious backseat driver that opens her mouth every three seconds as you race. At first it was nice to race and not be by my lonesome. By the end of my tenure with Ridge Racer 3D, I was wishing ill thoughts to my female driving companion. Thankfully, you can silence the woman by lowering the voice volume in the options, but this is a problem that has plagued previous installments of the franchise. Why is she still here? Get a face full of track with this first-person viewpoint. 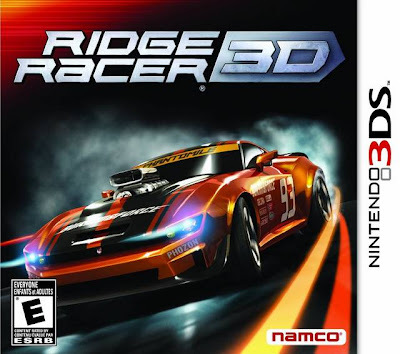 Ridge Racer 3D is not a technical showcase of the Nintendo 3DS, nor does it innovate the series in any way, shape, or form. 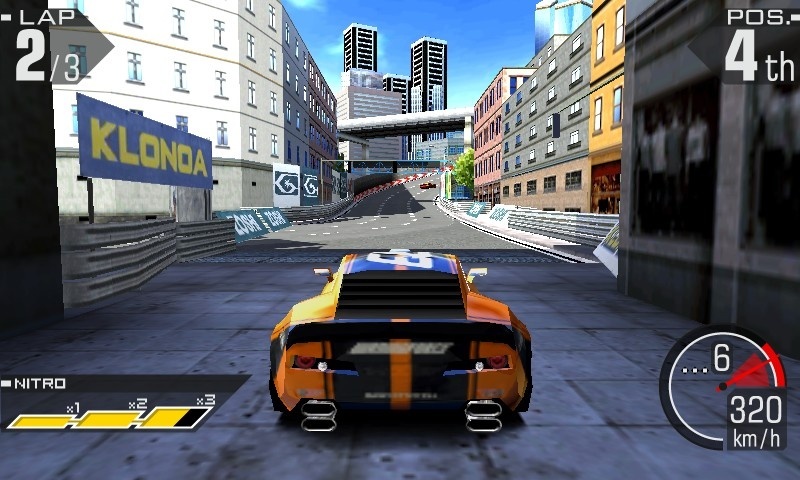 It, however, does supply an above average amount of single player content for what is now a really low price, and the track design is quite competent and enjoyable to hit the pavement on. The lack of online play is not the best news I can give, but at least this is actually a full-fledged game and not a scam to sell DLC like the Vita edition. If you like an arcade-style racer and don't want to get bombarded with blue shells a la Mario Kart, then Ridge Racer 3D is a truly acceptable alternative. Thanks for the review. I've been a bit torn on this one. My wife loves racing games. Other than Mario Kart, I cannot claim to love them, but I've been thinking about adding this one since you can find it on Amazon pretty cheaply - like $13. Most review sites have panned it pretty hard though, so I've been a bit reluctant to spring for it, but this is a much more detailed review than most and I suspect it's one my wife would probably get some mileage out of. I got it from a trade (got rid of the first Mario and Sonic game), and I liked it. It is a capable racer that I definitely enjoyed. You should look into getting it. Feel free to scold me if you or your wife do not like it.